In the A irrigation district in Yamagata Prefecture, Japan, a rehabilitation project is being implemented due to the aging of the irrigation facilities; 40 years have elapsed since the previous project was conducted. An overflow due to a rise in the canal water level occurred in early May of 2016. An increase in the roughness coefficient caused by algal growth in the canal was thought to be one of the reasons for this overflow. Therefore, the relationship between algal growth and the roughness coefficient in an 11-km section of the canal was analyzed in this study. The objectives of this study were to: (1) clarify the changes in the roughness coefficient associated with the growth of algae; (2) identify the dominant algae in the canal and examine the relationships between the growth/decline of algae and water temperature and sunshine; (3) determine the effectiveness of fiberglass reinforced plastic mortar (FRPM) panels constructed in an attempt to suppress algal growth; and (4) clarify why overflow occurred in 2016 but did not occur again in 2017. Ten algae observation points and four flow velocity measurement points were selected in the target section of the canal. Algae observations and flow velocity measurements were carried out once a week in the irrigation season in 2017. 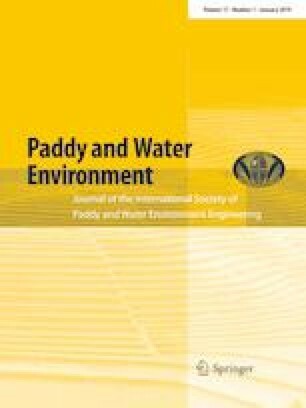 This study found that: (1) the roughness coefficient varied from 0.011 to 0.019 and increased with the growth of algae; (2) the major algae identified in the canal were Ulothrix zonata, Hydrurus foetidus, and microscopic diatoms, and since all of these are cold-water algae they started declining when the water temperature was over 13 °C; (3) the FRPM panels suppressed the growth of U. zonata and suppressed increases in the roughness coefficient; and (4) the main reason for the overflow from the canal in 2016 was that the period suitable for algal growth was longer in 2016 than that in 2017 due to irrigation beginning 10 days earlier in 2016 than in 2017. We would like to thank Mr. Akira Saito who helped in the identification of algae and Editage (www.editage.jp) for English language editing.